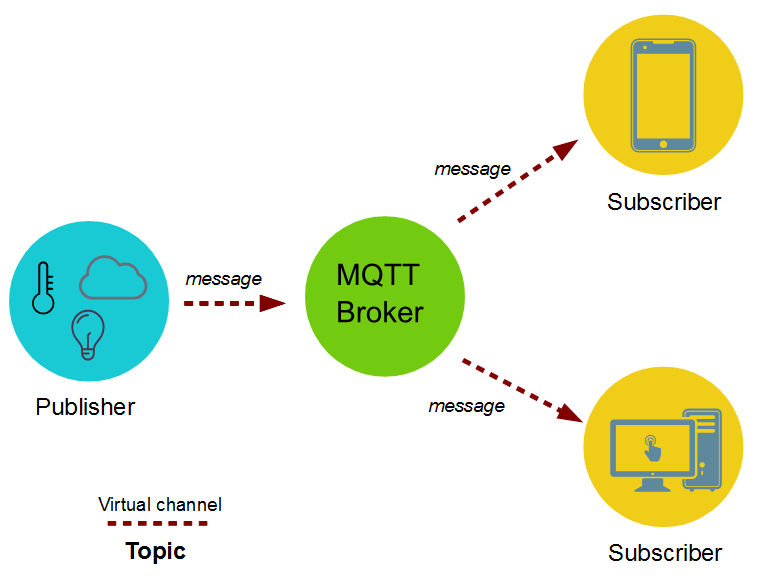 " MQTT is a Client Server publish/subscribe messaging transport protocol. " It is light weight, open, simple, and designed so as to be easy to implement. These characteristics make it ideal for use in many situations, including constrained environments such as for communication in Machine to Machine (M2M) and Internet of Things (IoT) contexts where a small code footprint is required and/or network bandwidth is at a premium So this is the definition of MQTT as you would find on Google. Let’s try and understand this is in very simple terms. MQTT is actually seen in daily life as well. So, how does the protocol work?? So let’s take the example of the newspapers coming to your place in the morning. Let us assume you are subscribed to some “ABC” newsletter. So whenever the “xyz” publication publishes “ABC” newsletter you get the newsletter at your place, delivered to your place by a local boy. So this is how the protocol works. In technical terms the ”xyz” publications is the publisher, you are the subscriber, the “ABC” newsletter is the topic and the local boy is called the MQTT broker whose the link between the publisher and the subscriber . You can subscribe to as many newsletters i.e as topics as you want. Anyone in this protocol can publish a newsletter, or subscribe to any newsletter i.e anyone can be a publisher or a subscriber. So according to the protocol even you can be publisher and the “xyz” publication could be a subscriber. The main advantage of this protocol is that I don’t have to pull a request when I need it i.e I don’t have to tell the publication that I need a newsletter please give me. MQTT is the protocol used by Facebook messenger and many other applications. I know this post came after a long gap, but i hope it was easy to understand :) ! !